Green Bay, Wis. — As the Green Bay Packers celebrate their 100th Season, the Weidner Center wanted to offer their own tribute to the team. The legacy of Packers’ coach, Vince Lombardi, remains strong in the streets of Green Bay. Everyone knows the inspirational story of his rise to fame with the Green Bay Packers, but the Weidner Center sets out to tell a different story: What inspired the man himself. 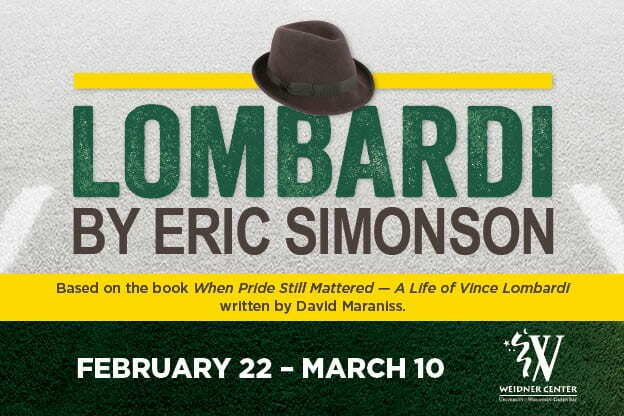 The first professional production in Green Bay of this 2010 Broadway title will premiere in the Weidner Center’s Fort Howard Hall on February 22, 2019 at 7:30p.m., “Lombardi” by Eric Simonson is a show you don’t want to miss. Tickets are on sale now at WeidnerCenter.com or call Ticket Star at 800-895-0071. Under the direction of Greg Vinkler, longtime artistic director of Peninsula Players, the Weidner Center takes on the new challenge of producing a play from the ground up. Vinkler is thrilled for the production and its impact on the community, “I’m excited to see this wonderful play come alive in its first full professional production in Green Bay. It’s a great opportunity to see why Vince Lombardi was such an inspiration to so many people and why he’s had such an enduring legacy.” The script is based on the David Maraniss book “When Pride Still Mattered” and tells the story of not just a coach, but of the man, in all of his complexity. The cast has been announced and rehearsals will start in Chicago on January 29. Neil Friedman and Carmen Roman have been hand selected to play Lombardi and his wife Marie. Supporting cast includes Geoff Rice as Michael McCormick, Eliott Johnson as Dave Robinson, Kevin Christopher Fox as Paul Hornung, and Evan Michalic as Jim Taylor. In addition to Vinkler as director, the creative team includes Scenic Designer Keith Pitts, Costume Designer Kärin Simonson Kopischke, Lighting Designer Jason Fassl, Sound Designer Christopher Kriz, and Props Designer Mealah Heidenreich. More information about the cast and crew can be found at www.WeidnerCenter.com. Don’t miss your chance to see the Weidner Center’s first fully-produced show February 22 through March 10, 2019. Tickets are available through Ticket Star by calling 800-895-0071 or order online at www.WeidnerCenter.com. Greg Vinkler (Artistic Director) Greg Vinkler is the artistic director of Peninsula Players Theatre in Door County. He has been with the company for 30 years and has done over 80 productions on its boards, performing in 50 shows and directing 32 productions. He also helms the Players’ winter play reading series, “The Play’s the Thing” presented at Björklunden in Door County. For his work with the Players he was honored with the inaugural Door County Artist of the Year award. Greg works extensively in Chicago as well, having performed at Chicago Shakespeare (38 productions), Goodman, Steppenwolf, Court, Writers, Northlight, Marriott Lincolnshire and Victory Gardens theaters. He has received three Joseph Jefferson Acting Awards and has been nominated twelve times. He also has two Artisan Awards, an After Dark Award, a Thespie Award and the Elizabeth Baker Award. He recently directed the Jeff-nominated production of “The Rose Tattoo” for Shattered Globe Theatre. Regionally he has performed at Milwaukee Rep, Paper Mill, N.J.; Fulton, P.A. ; Pittsburgh Public, BoarsHead, Mich.; and Milwaukee Chamber theaters. Greg appeared on Broadway as Doc in the Tony Award-winning revival of “West Side Story,” as Falstaff in “Henry IV” at the Royal Shakespeare Company in Stratford-upon-Avon, England, as Scanlon in “One Flew Over the Cuckoo’s Nest” with Gary Sinise at London’s Barbican Theatre, as Ergaste in “The Moliere Comedies” with Brian Bedford at the Shubert Theatre in Chicago and also with Vienna’s English Theatre and Singapore Repertory Theatre. Neil Friedman (Vince Lombardi) Chicago area credits include: The Goodman Theatre, Theatre at the Center, The Court Theatre, Chicago Shakespeare Theatre, Porchlight Theatre, Steppenwolf, Drury Lane, The Marriott Theatre and Peninsula Players. Regional credits include: The People’s Light Theatre, Pa.; The Fulton Theatre, Pa.; Utah Shakespeare Festival; Capitol Repertory, N.Y.; The New Victory Theatre, N.Y.; Flat Rock Playhouse, N.C.; Coconut Grove Playhouse, Fla.; The Clarence Brown Theatre, Tenn.; Children’s Theatre Company of Minneapolis; Austria’s Vienna English Theatre, Adirondack Theatre Festival, N.Y.; Arrow Rock Lyceum Theatre, Mo. ; and The Arts Garage, Fla. Neil is a proud recipient of Chicago’s Joseph Jefferson Awards. Please visit neilfriedman.info. Carmen Roman (Marie Lombardi) Theater credits include: “Scientific Method” at Rivendell, “Angels in America” at Berkeley Rep and “Native Son” at Yale Rep, “The Audience” at TimeLine, “My Fair Lady” at Chicago Lyric Opera, “Sotto Vocce” by Nilo Cruz at Portland Stage in Maine, and “Botanic Garden” by Todd Logan, “Angels in America,” the national tour, “The Iphigenia Cycle” with the Theater for a New Audience from The Court Theatre, Chicago, “The Mysteries’”with Classic Stage Company and 13 seasons with Peninsula Players, Wisconsin. She played opposite Hal Linden in “Moon over Buffalo” at The New Theater in Kansas City. Other credits include: “Wit,” “Black Snow,” “Brutality Of Fact” (Goodman Theatre, Chicago) “Side Man” (Steppenwolf Theatre, Chicago), “The Price” (Syracuse stage and Geva), “The Importance Of Being Earnest” (Centerstage Baltimore), Film/Television: “Proven Innocent” (Judge Licata), “Chicago PD” (Susan Williams), “Betrayal” (Connie Mrozek), “Boss” (Dr. Gabriella Reyes, recurring), “All My Children,” “Early Edition,” “Law and Order” (Judge Einhorn, recurring), “Law and Order SVU” and “Criminal Intent,” Awards and Honors: 2002 Fox Fellow, Sarah Siddons Award, Florence Herscher Award, Joseph Jefferson Awards for Master Class and Wit. This entry was posted in Go Green! and tagged Weidner Center on January 14, 2019 by Sue Bodilly.